Qualitatively, soaring flight is typically associated with large size in living flyers. Only relatively large bats have been recorded soaring often, and soaring flight over long distances is well documented for many large birds (vultures, gannets, albatrosses, eagles, etc). Soaring flight is less well documented for small birds, and it has typically been presumed that this is because gliding and soaring is less energetically useful for small birds than big ones. But, as it turns out, migrating with long gliding phases is an efficient way to go even for relatively small birds - or at least, for one species of small bird. Sapir et al., in a neat paper in PLoS ONE showed that bee-eaters run much lower heart rates when gliding and utilizing soaring flight than in continuous flapping flight (see figure from their paper at left). 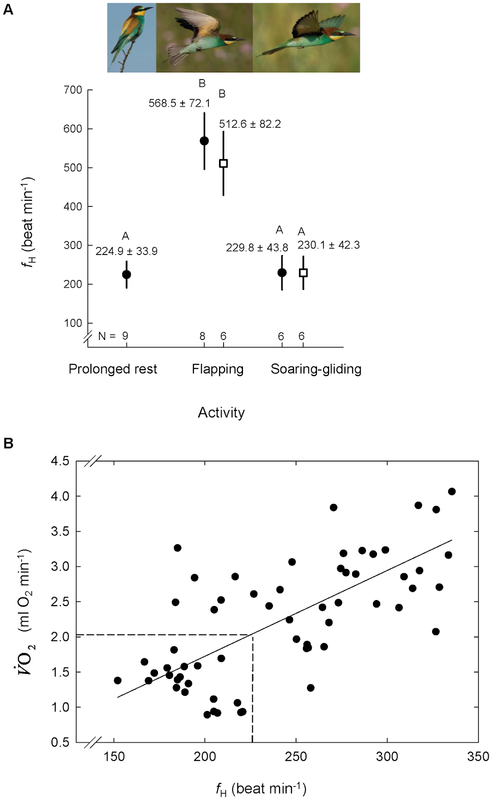 If heart rate measures metabolic expenditure they way they suggest, then this means bee-eaters still get quite a good deal using unpowered flight mechanisms over long trips. Now, this does not mean that soaring flight is not still more important to the biology of large flyers. One reason that soaring might still be more critical to the evolution and ecology of giant flyers compared to average-sized ones is that long bouts of continuous flapping flight simply aren't available to large flying animals. As size increases, flying animals start to face problems with mass-specific power scaling. This is solved by laying down large fractions of anaerobic (i.e. "fast twitch") muscle. Those high-powered muscle fibers have low endurance, however, so large flyers necessarily can only flap for short bursts - then they have to switch to unpowered phases of flight, and therefore use external sources of lift. It is not surprising then, that large flyers also, more often than not, have more adaptations related to soaring than small sized flyers, and this means that large flying animals are probably better at soaring that small ones most of the time. Still, papers like Sapir et al. (2010) are important in dispelling our myths about the effects of size in animal flyers. It is a greatly misunderstood area of biology, and one fraught with centuries of engrained concepts based on human intuition instead of careful measurement and analysis. It's good that modern researchers are taking a second look at the biology of size in animal flyers.